Follows Section 6 on Map 1B. This section coordinates with Map 4. If there is cause to suspect a prescription medication as the source of the person’s anxiety symptoms, then you should refer for a medical consultation [ Section 22 ]. 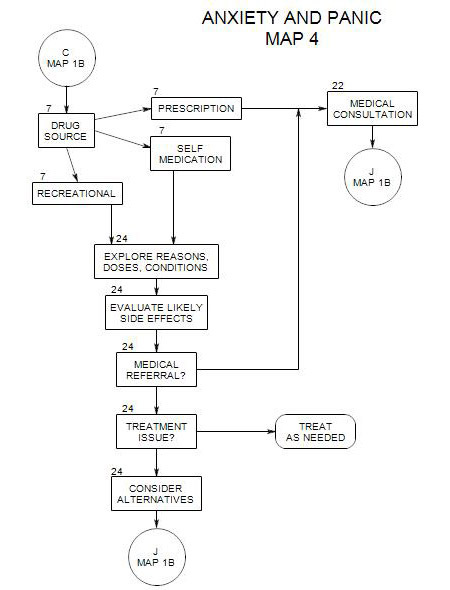 If you suspect self-medication or recreational drugs, you should explore the issue [ Section 24 ] and decide whether to treat the issue now, as a therapy issue, refer for a medical consultation [ Section 22 ], or make note and continue at point J of .